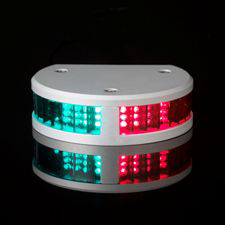 Lopolight continues to provide the world leading range of LED navigation lights. Compared to a normal incandescent navigation light Lopolights are extremely tough, have a very long life (50,000 hours) and consumes around 90% less power! These features provide numerous benefits including huge energy savings on the battery bank, smaller and lighter cable requirements for powering of lights and no need to change bulbs for the life of the product (50,000 hours). In addition to this they are compact and are good looking! A large range of models offers the right product for pleasure craft under 12m to commercial vessels over 50m in length. Full Lopolight range listed soon.